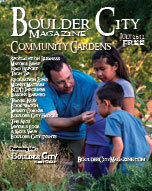 When you think of Boulder City, you think clean and green, a great image for our city. One of our nicest green spots in town is just around the corner, at Birch and Colorado Streets, the Boulder City Community Gardens. The gardens sit on the grounds of Boulder City’s original water filtration plant. Those who have not visited the community gardens have most likely driven by many times, possibly without realizing the green oasis tucked away there. I urge you to stop and explore the many varieties of plants the gardens are home to. The gardens were the result of a joint venture of the Green Team and The Hoe and Grow clubs in 1998. Through the support of the City’s Reflections Center and Urban Resources Partnership Funds, the Community Gardens became a reality for local gardeners of all passions. Here, fourteen years later, you can see the fruits of labor of these organizers and present gardeners, showing off a huge array of veggies, fruits, flowers and ornamental plants. While the individual gardens are leased annually, the gardens are collectively open to the public. Many of the neighbors of the Community Gardens take sunrise or sunset walks, bring their family and pet for a picnic, or just cruise through the garden aisles to follow the growth of some of their favorite gardens. Feel free to visit for a stroll, or come out and be a part of the many events and projects held there. One of the events is the annual gardening festival. 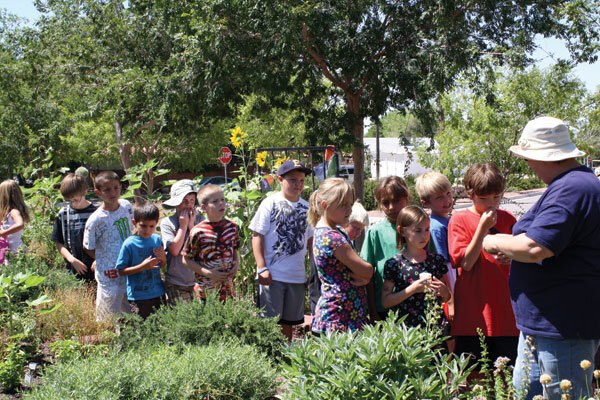 The gardens have hosted The Boulder City Spring Gardening Festival since 2010, held in April each year. The festival has it all for the plant lover and gardener in all of us: local gardening experts, workshops and an impressive plant sale. Since the Spring Gardening Festival has been such a hit, a Fall Gardening Festival is in the works. The focus of the Fall event will be on Fall and Winter gardening, with an addition of fruit and ornamental trees for the plant sale. The Community Gardeners coordinate monthly events and many are seasonal or holiday themed. Educational workshops are included, covering topics from seasonal planting to irrigation repair. July offers a Midsummer Night’s Dream themed event with music. August brings a luau to pep up those dog days of summer. Be on the lookout for upcoming notices of garden events. Some of you may have gardening questions and don’t know quite where to go to get answers. The Community Gardens have many gardeners that are in the horticulture, agriculture or landscape industry - some have even achieved their master gardener status. Many of the community gardeners have honed their gardening skills for generations and love to talk shop. If you are in the gardens and you find a individual working, feel free to ask them for their advice. Boulder City’s Parks and Recreation Department oversee the gardens, and a new project/partnership is in full bloom. The Recreation Department Summer Parks Safekey program now visits the gardens for an educational and fun experience. Through outdoor activities and scavenger hunts, the Safekey children are learning plant identification, care and upkeep of plants, recycling, composting and herb and vegetable gardening. This is definitely a project that brings the best of all worlds together. The Community Gardens support the 31ers Heirloom Hollyhock Project by cultivating plants to be distributed throughout Boulder City. Many gardeners, and other residents, are nurturing these plants for fall plantings that will supplement the 31er Heirloom Hollyhocks that were planted this spring. An ongoing educational and practical program teaches the history of the 31er Heilroom Hollyhock in Boulder City, and brings that aspect forward to planting and care of the flower in our community. Proudly, the 31ers Heirloom Hollyhock has been named the official flower of Boulder City. This particular project is seeking individuals to help monitor, cultivate and care for these 31ers Heirloom Hollyhocks so that they become a colorful thread of local history which weaves throughout our community. The Community Gardens are open to the public for viewing purposes. Currently there is a waiting list to obtain a plot in the gardens. Take some time to visit the gardens as they are a peaceful, colorful respite from the busy world around us. There’s something contagious about the Community Gardens, just ask the humming birds that have discovered the magic. You’ll be amazed how the grace of Mother Earth has come to flourish right here in Boulder City. For more information on projects and events at The Community Gardens, contact Boulder City Parks and Recreation Department at 293-9256.